Why is this photograph so famous? 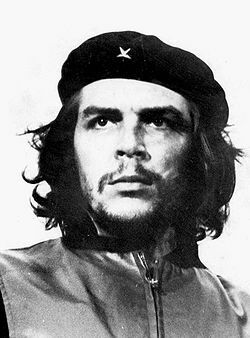 Alberto Korda’s portrait of the Argentine marxist revolutionary Che Guevara is said to be the most widely reproduced photograph in the world. Probably most of us today who see this photo will recognize the image but not the person. Korda called his portrait the "Guerrillero Heroico," (Heroic Guerilla Fighter), making Guevara an international hero during the height of marxist and Communist fervor in the 1960s. Here, Guevara is shown as he stood at attention in Havana, Cuba, listening to a speech by his own hero and leader, Fidel Castro.